Mint Jade Donut Earring with beaten silver overlay. 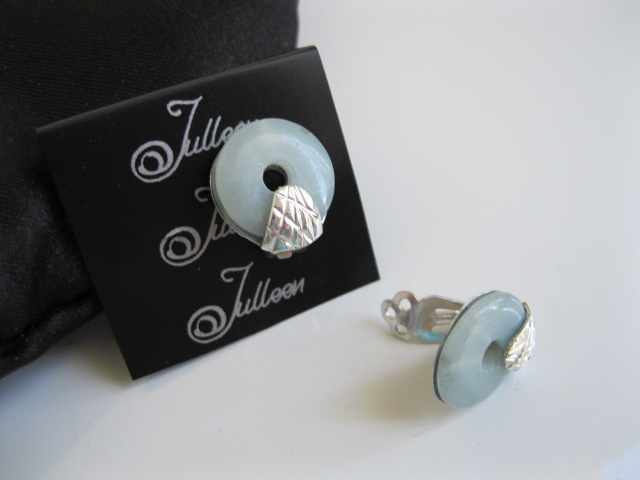 All hand made in lovely Sterling Silver with imported Italian Silver Earring Clip. We know at My Bridal Jewellery, it’s often so difficult to find clip on earrings for women who don’t want their ears pierced. With this in mind we created the clip on earring in a lovely variety of styles and shades but always with that special Julleen designer touch of elegance. Now a mother of the bride can feel the luxury, of wearing earrings at any time. These are so light and comfy to wear and would enhance any outfit of green, blues or creams, for a wedding day or any time for many years to come.